Madina was the final destination of prophet Muhammad, only prophet recognized by Islam, when his Hijra came to an end from Mecca, both of them located in Saudi Arabia, at the same time that it became the capital of an growing Muslim empire. At the beginning, it was Muhammad himself who led the authority in Medina for being later succeeded by the different caliphs who, over time, were responsible of leading this city. In this article we are going to talk about the History and generalities of Makkah Madina Saudi Arabia. This city was the power base of Islam during the first century in which this religion developed its first community. Three of the oldest mosques were built in Medina, those mosques are Quba Mosque, al-Masjid an-Nabawi Mosque and Masjid al-Qiblatain Mosque, with all the implications that being the home of so many mosques has for Islam. The religious importance of Makkah Madina Saudi Arabia lies in the fact that al-Masjid an-Nabawi Mosque is in Medina, besides that Muhammad’s tomb was later annexed to it to become part of the mosque itself, fact that took place when Caliph Al-Walid I enlarged it. 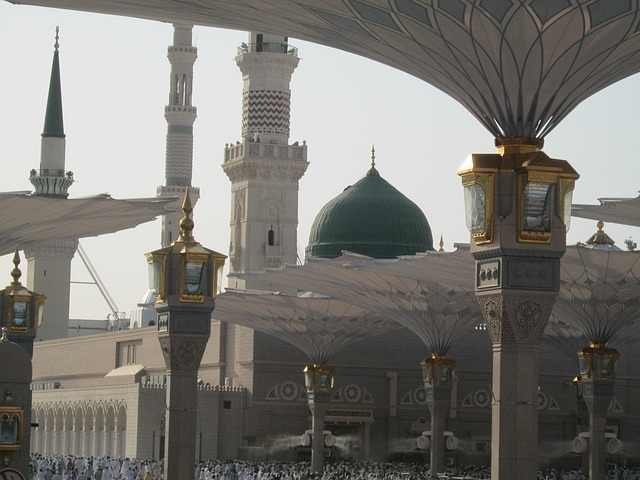 Another important fact is that Medina was Muhammed and his followers’ refuge when he was obliged to run away from Mecca, so Medina became the second most important religious city for Islam, which has remained until these days. The fate of the first mosque, which was built when prophet Muhammad was still aliv, was not as lucky as Masjid an-Nabawi since it was destroyed by lightning and the tombs lying there were forgotten. Mount Uhud is also in Medina, which is a scenery north of Medina where the second battle between Mecca forces and muslims was fought. During pre-islamic era, Medina was inhabited by polytheist arabs and by three Jewish tribes. In 622, twelve years later after his preaching in Mecca, is when Muhammad and his followers’ Hijra (migration) takes place since they could not continue running the risks of the persecution they had been suffering for a long time any more. The destination of their getaway was the community of Yathrib, name by which Medina was known before the emergence of Islam, which was inhabited by Jewish refugees, who had found shelter there while waiting for the arrival of the prophet their scriptures had foretold. Many were the battles that the muslims from Yathrib fought against the polytheists coming from Mecca, being the last of them the one that gave place to an armistice that allowed Muhammed to pilgrimage towards his home city, Mecca, in 629.